This device is compatible with the Samsung Galaxy Note 4/S5, Nexus 5/7/4, Nokia Lumia 1020/920/928, Moto Droid, HTC Droid/Rzound, Blackberry Z30, plus all Qi-enabled Phones and Tablets from manufacturers such as Samsung, Google, LG and HTC. The unit costs around £60 and is sold by Qi-Infinity-EU. 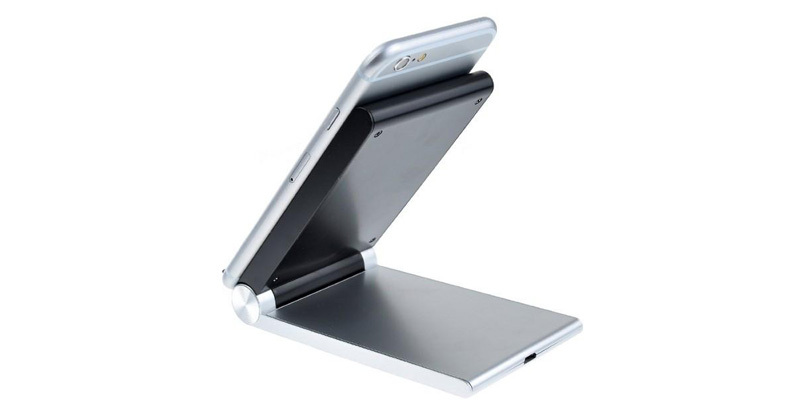 Qi certified from the Wireless Power Consortium, this dock is a folding desktop charger made from the highest quality materials with a fast charging 3-coil design with wide charging area which can support any angle up to 90 degrees for charging. The Qi-Infinity Wireless charger has in-built smart IC design which means automatic and efficient power transfer that will support all devices equipped with a Qi-compatible receiver. The Qi-Infinity 3-Coil Folding Wireless Charger comes with a 1 year warranty for peace of mind but please ensure your mobile device has an in-built Qi receiver, or you have an external Qi receiver/case – otherwise this unit will not work. This device is not compatible with AT&T PMA technology so will not work with PMA phones, it requires a Qi receiver. This fold-able wireless charger is one of the more expensive QI certified chargers available on the market, but it does have a quality feel to it and it really looks great too! Plus you can actually use your mobile device while it is charging with the Qi-Infinity,a feature that is not available even on official wireless chargers from manufacturers like Samsung. One of the best wireless charging pads available right now, with some useful features and a high quality expensive look and feel (unlike some wireless chargers on the market which look as if they were made very cheaply indeed simply to capitalise on this new market), highly recommended.